Your sleek and sporty Mini draws attention everywhere it goes. Sometimes, your Mini Cooper requires factory scheduled maintenance or various auto repairs in order to keep its ride smooth and reliable. 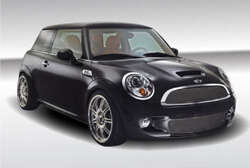 Our factory trained and ASE Certified Technicians at Hollin Hall Automotive are well trained in all the parts and systems that help your Mini maintain its reputation as the reliable car you and your family depend on. In case of repairs or schedule maintenance, visit our facility, where we care about your vehicle as much as you do and are eager to get you back on the road.